Yesterday my husband and I went to our grand daughter's pre-K class to talk about our ancestry. All of our parents were born in the United States. All of my husband's grandparents were born in Belorus and emigrated to the US from 1900-1908. My grandparents and 5 of my great grandparents, were born here. But my great grandmother, the only one I knew, was born in County Armagh, Ireland and moved here alone, following her fiancee, in 1887. 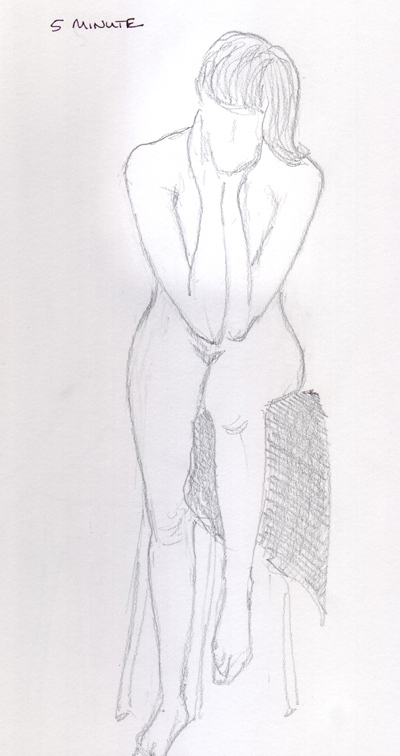 She was a really cute, very elderly woman when I was a child - somewhat deaf and never without her black cane. 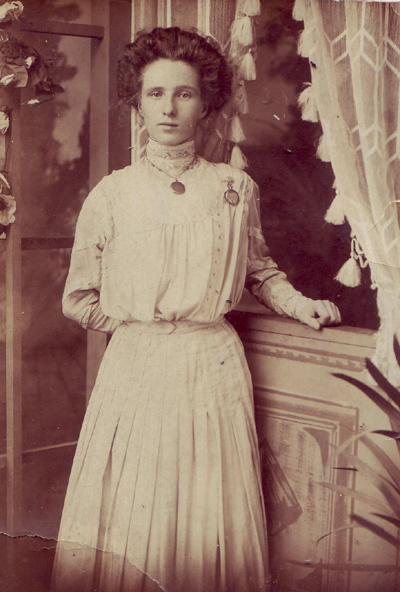 Here is a picture of Annie Ballance which was taken upon her arrival in New York City. When I researched our family, I found her passenger list, which recorded 2 pieces of baggage - both of which I now own. 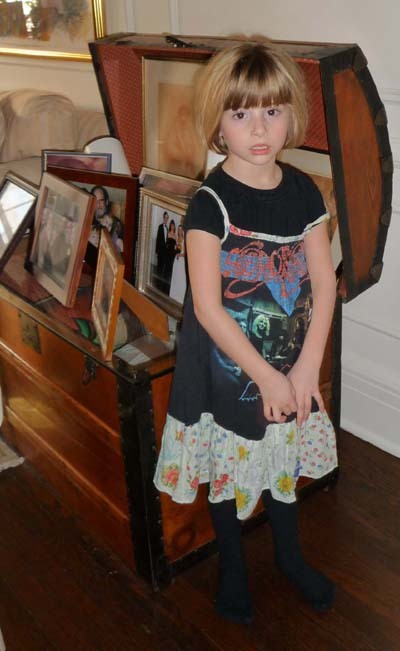 This is a picture of Sydney standing near the largest of her steamer trunks, which is in our apartment. I scraped off the paper cover and stained both trunks 50 and 30 years ago - and have moved them from place to place since then. This trunk has a wallpaper lining and glass top filled with family photos. All of the quilts I made that are no longer in use are carefully folded inside. 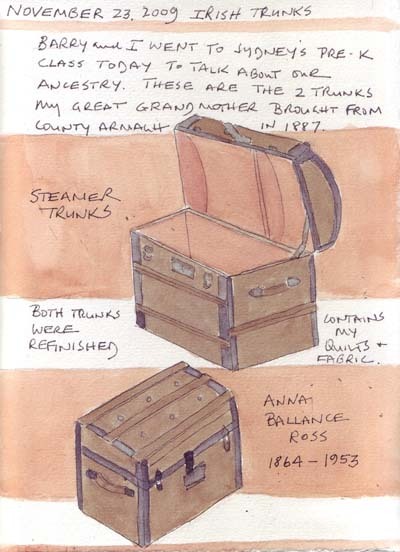 I was delighted to finally paint both trunks as part of my journal page from yesterday - reflecting our visit to Syd's class. I love strolling on Madison Avenue, past the windows of the famous designer boutiques. 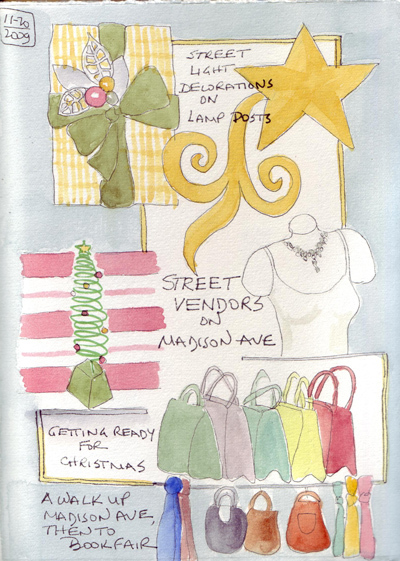 But Madison Ave also has its share of street vendors, and as I walked up on Friday, I sketched their wares and the street decoration that has already been added to the lamposts for Christmas. 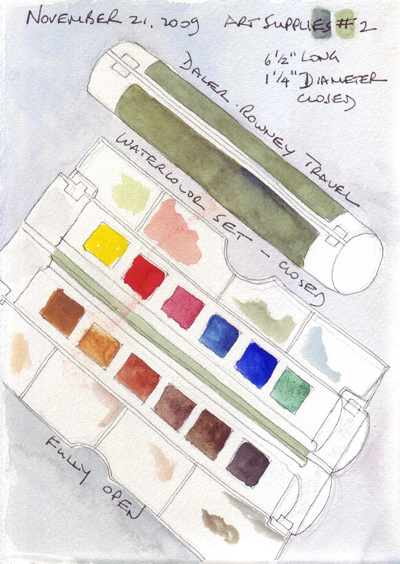 When I carry my sketchbook and pencil case, I also carry this artist grade travel set of watercolors by Daler-Rowney, but half the time I draw when I'm out and then paint using my regular Winsor-Newton palette at home. I plan to replace these paints with my palette, but never do...maybe next year. The size and shape of this travel set is wonderful - and the mixing areas include the flat areas and 4 deep end wells. 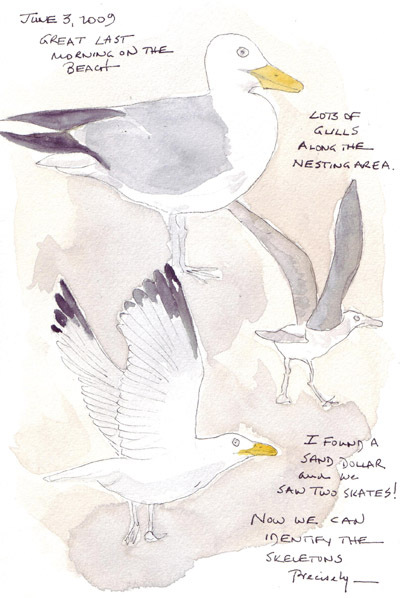 I am currently taking Kate Johnson's "Keeping an Artist's Journal" on-line class, so I will probably upload daily journal pages more frequently to my blog because I need to also upload them to our class Flickr pool to share with Kate and my classmates. 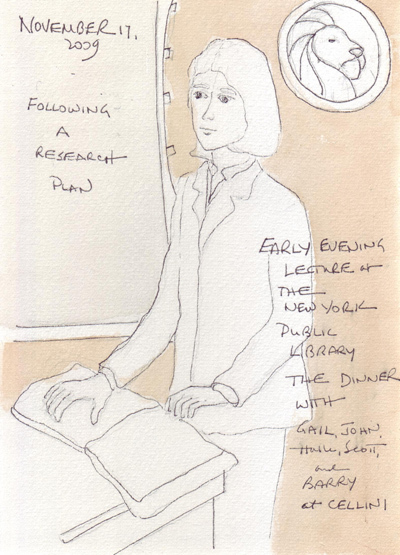 Tueday: Busy Day, so I sketched my lecturer at the New York Public Library Tuesday evening. I did have paints with me, but felt very conspicuous the way the seats were set up. 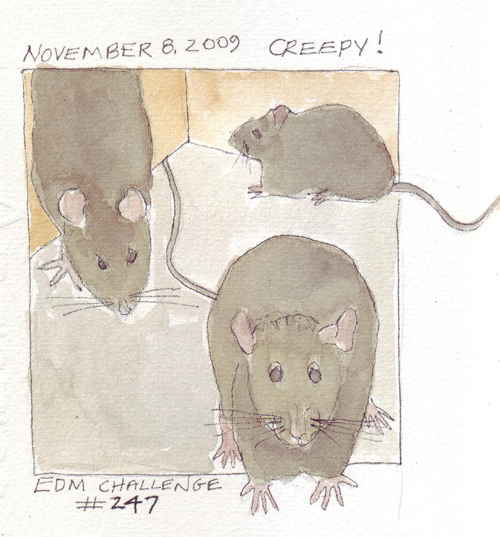 I decided not to finish painting her as I experiment with different ways to compose my artist journal pages. 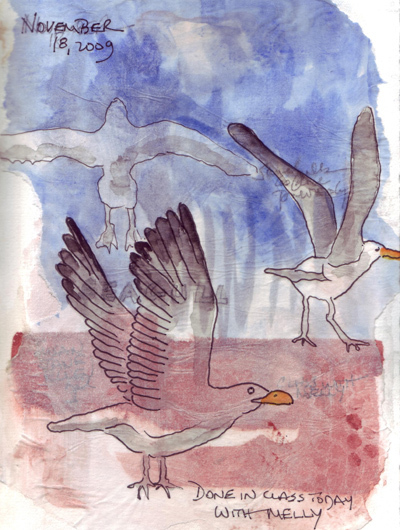 Wednesday: Melanie Testa and 3 other art buddies played with Melanie's method of tracing images from our journals, painting them, painting a background on WC paper in our journals, and then gluing the two layers together. These were sea gull images from my summer vacation journal - and a link to the original journal image from my blog in June 2009. Her method is described in an article she wrote in the May-June 2009 issue of Cloth Paper Scissors. 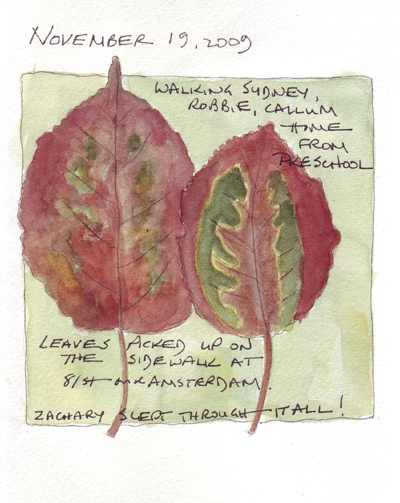 Thursday: Two leaves I picked up from the sidewalk when walking home from nursery school with 4 of our grandchildren. They were sketched and painted when I came home from babysitting last night. I have no idea what kind of trees they are, but every autumn I find a few of these gorgeous patterned leaves on New York sidewalks! 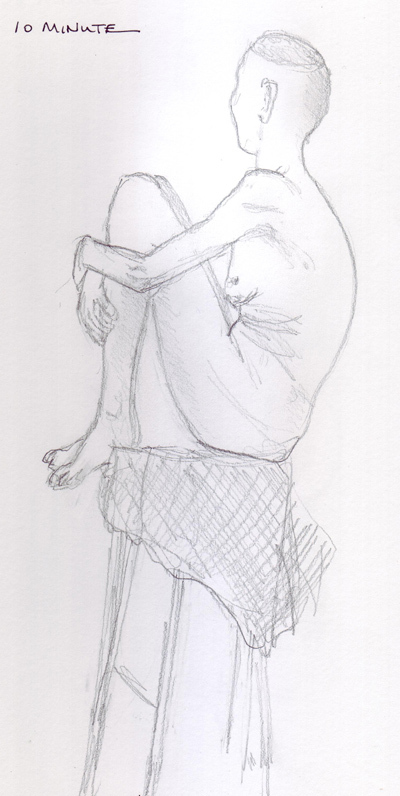 Last night was my 3rd figure drawing session at the Society of Illustrators in New York City and I came home with 19 sketches, even though I really didn't like one of the two models. This was a new experience and I had to convince myself that I didn't need to like the model or their poses - it was all an opportunity to practice drawing. The standard format is 10 two minute poses, 4 five minute poses, 2 ten minute poses, and 3 twenty minute poses, with breaks, over 3 hours. I'm posting one from each group. This is the other model - small, really skinny, shaved head except for a circle of bright yellow short hair in a circle on the top of her head. However, it was the contorted positions that she took which I didn't like, except this one. I loved the setting, really enjoyed the live piano and double bass music throughout the evening, and appreciated the glass of red wine while sketching. I love my black shearling mittens, especially when it is really cold in New York City. 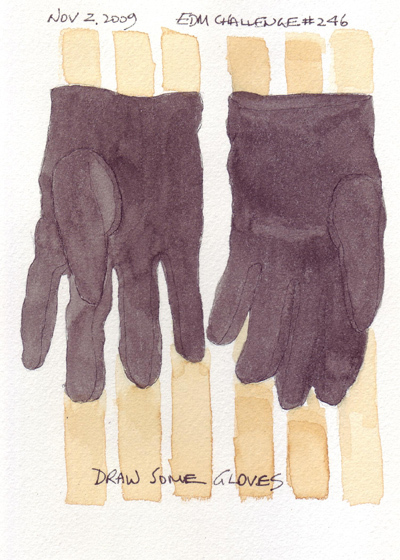 But they just looked like two black blobs on my journal page, so I sketched my black leather gloves instead. Approximately once each year our local TV channel shows footage from surveillance cameras in fast food restaurants - and after the restaurant is closed, the camera captures the image of rats in the kitchen. It really creeps me out - and also makes sure that I never visit that fast food chain - because of course I can't remember which branch it was in this big city.